Although the books I’ve written in the Madden series are sometimes described as historical, I prefer to think of them as heralds of the modern age. Historical for me means men in funny hats and people travelling in horse-drawn carriages. Once women’s skirts rose above ankle length the old world crumbled. The idea of embarking on the Madden series came some years ago from an idle thought: how would the police have dealt with the problem posed by serial killers before they were recognized as such—before the very concept of forensic psychology had been developed? By chance, at around the same time I happened to be going through some old family albums and came across a scrapbook kept by my paternal grand-parents in memory of their elder son who was killed in the First World War. Paging through it I discovered something I hadn’t known before: that the telegram they had received advising them of his death had arrived the same week as another from the War Office informing them that their second son, my father, who like his brother was an officer in the British army, was missing. Luckily he proved to have been captured, but I was struck by how appalling these twin blows must have been to them at the time and from that point on I began to read more about that terrible conflict and the scars it left on society. These two trains of thought came to-gether and eventually led to the first of the Madden books, River of Darkness, in which the psychological damage inflicted on both protagonists, hunter and hunted, by their experiences in the trenches plays a major part in the story. I’d resolved from the start, too, that I wouldn’t get trapped in a long series following the usual pattern of one case after another. Rather, I wanted to place Madden and those around him—his wife and family, and his colleagues at Scotland Yard—in the context of their time; to see them grow older and their lives develop quite apart from the mystery elements in each story. Hence the clear historical links which all three books have. The first, as I said, takes place in the shadow of the Great War, the second, The Blood-Dimmed Tide, against the rise of fascism in Germany and the looming threat of another war, while the third and most recent, The Dead of Winter, has the bombed-out ruins of London in the closing months of the Second World War as a backdrop. Mystery writers are sometimes asked which they think is more important—plot or character; I would unhesitatingly plump for the latter. Of course it’s necessary to have a good story; apart from anything else it prompts the reader to keep turning the pages. But there aren’t that many plots when you think about it, only variations of them, while human nature is infinite in its variety. I set out from the start to give my characters lives larger than the stories they happened to be caught up in and to watch them as they developed over a period of time that now spans more than two decades. That said, getting the atmosphere right, avoiding anachronism, is always crucial in books set in the past. The physical side is easy enough. It’s not difficult to bone up on what people ate, how they dressed, what cars they drove etc. But what’s more important is determining how people behaved to one another. At the time when my books are set, particularly the earlier ones, they were generally politer than now, more gentle. Set against that, however, was the hierarchical nature of society, a product of the notorious British class system. Certainly there was too much forelock-touching for our taste, too much deferring by the so-called lower classes. But all this was a necessary part of the books’ atmosphere. Mostly it boiled down to how people spoke to one another and in that I was helped by my memories of my father, who grew to manhood in that period. Whenever I wrote a piece of dialogue I was uncertain about, I’d ask myself how it would have sounded to his ears. Or, better still, would he have put it that way? To return to the question I started with—how the police might have hunted a serial killer then—I resolved early on to introduce a form of ‘profiling’ into my plots, while recognizing that this would have been resisted by diehard elements in the police force at the time, and for that reason I created the character of a Viennese psychoanalyst, Dr. Franz Weiss, who appears in the first two books. A pupil of Freud’s, he is able to offer invaluable advice to the detectives investigating the series of murders, and being Jewish he also becomes a symbolic figure in the second of the two stories as the Nazi party comes to power in Germany. It was through the character of Weiss that I was able to explore the roots of Amos Pike’s murderous impulses in psychological terms recognizable to a reader of today, though perhaps not to one of the time in which the book was set. He became to my mind like the dark figure in Yeats’s poem, slouching not towards Bethlehem certainly, but perhaps into our modern consciousness. 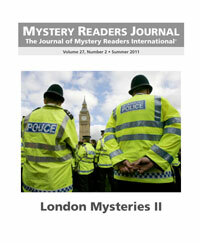 Although this piece is included in a ‘London Mysteries’ issue, in fact the capital plays only a small part in the Madden books. True, there are periodic glimpses of Scotland Yard and readers of the series must be well used to the view of the Thames and the tree-lined Embankment it offers. And the third book does feature a London damaged by war and bone-weary of the long struggle. It’s a city I never knew, of course, and barely recognizable in the present-day metropolis. But the image we all carry of London in those days, with the bombs falling and the searchlights piercing the night sky, is so familiar that even as I was describing them I half felt I’d been there. However, most of the action in the books takes place in a still unspoiled countryside, and this is deliberate. The image of terror stalking the fields and quiet country lanes of England seemed a potent one, given that the books’ overarching theme is the change brought about by the First World War: not simply to society but to the very way we think about ourselves. Still suffering from the after-effects of his experience, Madden is one of the few to understand the dire message of the carnage inflicted in the trenches. That now we truly know ourselves and the world will never be the same. Rennie Airth‘s work has been translated into more than a dozen languages and has been nominated for the Edgar Award in the US, the Historical Dagger award in Britain and won the Grand Prix de Littérature Policière in France. He lives in Italy. Write about what you know—that’s what we’re always told, isn’t it? Well, I should know London really well. I grew up about thirty miles away in Kent and we made frequent trips to the city. My brother and I were allowed to choose Sunday outings. For him it was always the science museum or the London zoo. For me the Victoria and Albert Museum (with the royal doll houses) or the observation deck at London Airport. Funny how early our true personalities were revealed! We were taken to Selfridges at Christmas to visit Father Christmas in his grotto and see the lights. We always went to a pantomime. By the time I was ten or eleven I was allowed to take the train to London with friends and we wandered around feeling very grown up. I was a student at London University and learned all the good cheap places to eat. We’d get up at six in the morning to line up outside a theater to get standing tickets for that night’s performance, and then stand through the whole show. That way I saw shows like The Sound of Music the first week they came out. After college I went to work for the BBC and shared a flat with three college friends on Queen Anne Street, just behind Oxford Street and literally steps away from Broadcasting House. This meant I could stagger out of bed at 8:45 and be on the set by nine. I also sang in folk clubs and would walk home across Soho at two in the morning without anything bad ever happening to me. As you can see from this London was essentially a very safe place in those days. There was usually a helmeted bobby standing on a corner who could offer assistance if needed. A foreigner, especially one strangely dressed in a sari, would attract attention. Now it is I who feel like the foreigner when I’m in London! You’d have thought that with all this familiarity with the city, I would have set my stories there before now. Constable Evans occasionally had to go to London but hated it and escaped as soon as possible. So it was only when Lady Georgie, Her Royal Spyness, fled from the confines of her Scottish castle to the family home on Belgrave Square that I finally set a book in London. And learned something—there are dangers about writing what you know. Because what you know and what you only think you know blur in your memory. I made a couple of mistakes in that first book. I put Claridges on the wrong street, which is especially sinful because my parents lived next door to the manager of Claridges. I used the wrong tube station once. Of course people wrote to me. People always love to point out mistakes. And I learned that I should not be trusting my memory to write these books. So for the second book I went over and walked the streets that Georgie walked, double-checked my tube maps and took hundreds of photos. Much of London was destroyed in the Blitz in WWII, so I have to seek out the areas that are unchanged since the 1930s. Georgie’s house on Belgrave Square is as it always was and all those lovely shops along Pall Mall and through the area of St James have not changed since Victorian times. There is still the chemist with bottles of colored water and old fashioned tonics in one window, gentlemen’s hairbrushes and pomades in another. The discreet and understated windows at Fortnum and Masons. The gentlemen’s shirt maker, by appointment to King Edward VII. If I want to relive the 1930s I walk past those shops and the various clubs that are clustered between Haymarket and Green Park. By that I don’t mean nightclubs or dance clubs. I mean gentlemen’s clubs in the old sense, where a chap could go to escape women, dine with the fellow chaps and be waited on by aged attendants. I can’t check out the clubs for myself. Still no women allowed in most of them! One has to search hard to discover those vignettes of bygone eras in London. Rules restaurant, the oldest in London, with signatures on the walls of Charles Dickens, Disraeli, and all kinds of people who made British history. Sitting in their oak paneled dining room, eating pheasant, really reminds one what life used to be like for those who had money. Shopping at Harrods is alas no more what it was. Now it’s a tourist trap. When I was small there was a graciously obsequious attendant to tell you what dress and color would suit you. There was a distinguished floorwalker as in Are You Being Served? I have to go out of London to put myself back into Lady Georgie’s time. Some of the small country towns with their tea rooms and Lady’s Modes dress shops and friendly corner pubs and young girls riding their ponies down the high street have not changed. Neither have cream teas, Cornish pasties, fish and chips… Food is one of the major reasons that I escape from London and seek refuge in the country. To be frank I am overcome with nostalgia when I go back to London. It is no longer a safe city, a clean city, or a city of witty old Cockneys. There are more foreign accents than English ones. You’d have to look hard for a fish and chip shop. Old London is essentially gone. Pity. Rhys Bowen is a transplanted Brit who now divides her time between California and Arizona. She writes two historical mystery series featuring feisty and independent female sleuths—the Molly Murphy mysteries set in 1900s New York City and the lighter Royal Spyness series about a minor royal in 1930s England. When I wrote my first three crime novels, I was living in a village in the northern English countryside, and feeling that it was entirely the wrong place for me to be living. People do things in rural English villages that I barely understand: baking, insisting on growing vegetables when perfectly reasonable ones are available in shops. I often went to London to meet my publishers and my agent, and when I did it was like a breath of fresh air. Or rather, it was like a breath of polluted air that, psychologically, felt fresh (if that makes sense). I felt as if I belonged in a city, with all the other people who care more about books and going out and having fun than about cars and owning land; all the other people who are too busy to cook and who go to restaurants wearing whatever they happen to be wearing, instead of dressing up for a special night out. Cities and me were a good match, I decided, and I was suddenly desperate to set my next crime novel in London. The problem was, my series police characters who had featured in my first three thrillers did not live in London—they lived in Spilling, a fictional English town in a fictional English county called the Culver Valley. Suddenly, the feeling of rural stagnation and suffocation that I had in my real life spilled over and affected my work—I feared my novels might stagnate unless somehow my poor characters could escape the Culver Valley and see a bit of London action, even temporarily. So my fourth novel, The Dead Lie Down (UK: The Other Half Lives, 2009), has a London sub-plot, which requires my detectives Simon Waterhouse and Charlie Zailer to get on the fast train to London King’s Cross, and I have always loved that aspect of the book. Geographicaly, it felt like a more sophisticated, more city-ish novel, than my previous thrillers. Ever since, I have been obsessed with where to live, and that obsession has been prominent in my writing. In my latest book, Lasting Damage (which will be published in the US next year under the title The Other Woman’s House), the heroine Connie lives in a tiny rural hamlet and is desperate to move to Cambridge—where I now live. And London is mentioned in nearly all my books in passing—in the one I finished writing last week, Kind of Cruel, Charlie Zailer’s sister Olivia, who lives in London, describes a rural village as “the middle of nowhere” and Charlie takes offence at her London arrogance. I think I will always be obsessed, as a writer, with why people choose to live where they live.